I've enjoyed getting to know Margaret Feinberg through her writing, her new books, her website, and her blog. 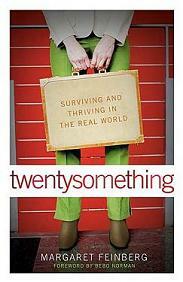 And having Twentysomething (2004, W. Publishing Group) as a testimony of her formative young adult pre-marriage years, pitfalls and all, has been fun - makes me wish she were older, writing these things fifteen years ago when I probably really needed it. Now that I am in my late thirties and looking back on so much of this period in my own life, I can only add, "you ain't kiddin'" to that thought. The "rude awakenings" she surfs through in chapter one, from "1. You have to work" to "4. Life is expensive" to "10. I know less than I thought I did (and I didn't know much" were spot on for what I felt I went through in that awkward post-college pre-rest-of-my-life stage. That's me today more than back in my early 20s, but one of those lessons I wish more people would learn is that it's okay to ask the tough questions and to wrestle with the tough answers. I think the thing I've found in her writing is an ability to make it personal from her own life, and the sense to ask others about their own trials and circumstances - filling in the gaps with interviews and other authors gives the book a feeling of, not completeness, but of fullness - you might have more to experience, but this work will work in the midst of it. There's a great deal of depth to this book, and there's a great deal of practicality as well. Thoughts on the significance of life in the universe with the Loving Creator are balanced with the notion that you're going to have to be creative to pay your rent sometimes. And her approach to the 20s will work well as she heads into her 30s and marriage and whatever lies ahead. And now that I've finished her book, I've got a handful of twentysomethings that I'm thinking would benefit from her experience and prose as well. what would a young 18 yearold get from it that she wouldnt get from listening to the warning bells of the parents who are trying to help her navigate thru the rough waters of late adolescence? she would get it from someone other than her parents, which has a weightier feel to it when it comes to "advice". it's very real, very earthy, very well written. i'd recommend it for your almost 20something.